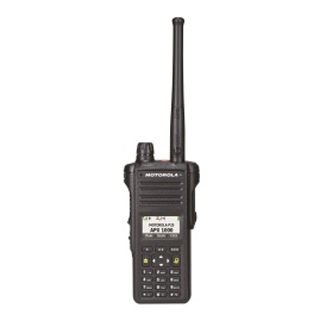 The APX1000 provides a complete and complementary look and feel to the APX family of P25 TDMA radios. With a two-microphone design to reduce background noise and excellent RF coverage, the APX1000 is engineered to give you the smallest P25 Phase 2 capable radio on the market today. Engineered with a simplified control top to ensure ease of use, the APX1000 is the ideal solution for local government and public works users who require quality P25 functionality. Dimensions (hxwxd) (without standard battery): 5.26" x 2.37" x 1.72"
Weight (without standard battery): 8.22 oz.